When I started experimenting with 3D printing, I did a bit of research on the alternatives, and the requirements for the various plastics. From that search, I figured that ABS would require "care", while PLA would be simple to get started on. I didn't really know how I would build my printer, so I settled for printing in PLA. Generally, I've had good success with printing in PLA. The thing I've generally struggled most on with PLA is getting good, even extrusion. I would frequently get jams, extruder "rollback" or uneven extrusions. When I got successful prints, they have generally been OK looking, and I've always had good print adhesion. 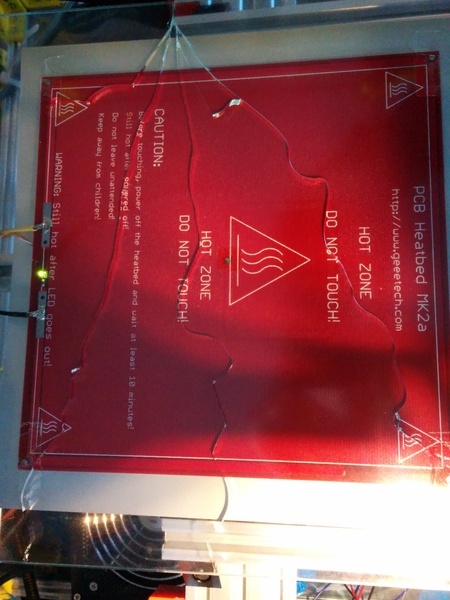 From my third print I've always done PLA directly on a 60ºC heated glass bed. My first printer build was a RepStrap type build where I modified my wooden desktop CNC with a direct extruder hotend, a heated glass bed and a RAMPS1.4 based controller. This setup was slow. CRAZY slow. In the picture above, I'm printing 5mm calibration cube steps. This print fits inside a 2.5x2.5 cm "box", so it's really quite small. But it still took just under 1.5 hours to print! From this slowness, I got a few heat related problems. My filament was "sitting" in the hotend, passing through it very slowly, so I got blockage of the hotend caused by soft filament, and I also ended up with heat damaged prints. The slowness also drove me crazy, a typical useful part would take more than 12 hours to print. The OpenCoreBot project was a direct reaction to this. I wanted SPEED! And in that respect, the OCB was a success. I went from a maximum usable printspeed of 4.5mm/s on the RepStrap, to possible rapid-speeds above 10 000 mm/s! Naturally that speed is way too high for reliable FFF/FDM prints. But I did try printing PLA on speeds in the 50-60mm/s range. And initially it seemed OK. But I was starting to really really struggle with jammed feed/jammed extrusion and "rollback" where the stepper motor driving the extruder gets overloaded because it can't feed filamet through, and skips backward a significant amount. I tried tweaking temperatures and feed percentages but couldn't get a good result. I designed and built a new bowden extruder driving mechanism and got a lot of improvement from that, but still had problems. After replacing window glass with oven door glass (a type of borosilicate glass) I found a really simple solution to the problem of getting ABS prints to stick reliably. Get the first print layer close to the bed to achieve good squeeeze-out, and use simple hairspray on top of the glass to get a sticky somewhat porous surface to stick to. Switching over to ABS took away so many of my problems. I had no blockages, failed feeds and (almost) no rollbacks. My prints all came out as expected, and I had no problems with warping, delamination from warping. Sounds like success, right? But no! Most of my ABS prints were done during summertime. And all of the prints were either really small, or with thin features. As a result of that all my prints were in the "best case" range for ABS prints. Then I started printing parts to upgrade my printer, and those parts were with significant "bulk". On top of that, it's now winter, so ambient air temperatures are lower, with less humidity. Suddenly warping has become a big problem. I did some tests of rigging up a shoddy heated build chamber, and got some improvement. However, I heated the "chamber" using a cheapo fan heater. My approach actually made my prints get "blown loose". Generally, I've come to the conclusion that for ABS a heated build chamber with low turbulence. When I came to that conclusion, I was still waiting for parts to rebuild/upgrade the printer, so I did not start building a "proper" solution. Instead, I decided to revisit PLA. Generally, what I've done to overcome my frustrations with the material is summed as two things. First: print hot! PLA has a glass transition temperature (the material gets soft), a melting temperature (the material starts to flow), a degradation temperature (where hydrolysis and a "crystalization like" behaviour starts) and a decomposition temperature (basically, it gets close to catching fire). Normally, these are around 60-70º( glass), 170-190º (melt), 215º (degrade) and 250º (decomposition) respectively. However, most filament producers do not have a 100% clean production line, and quite commonly other materials (PDLA, PBAT et al) are added to stabilize and extend temperature range of the material. By experimenting with extruding filament at different temperatures, one can find a temperature that is very close, but not quite the same as the degradation temperature of one specific PLA filament. This temperature will be different almost batch-to-batch (read this as roll-to-roll). But some consistency can be expected from the same supplier, so it's possible to use this temperature! Printing hot increases the risk of making the filament soft in the feed-in part of the printers hotend. My approach was to locate my not-quite-degradation temperature, use that as my "first layer temperature", and stepping back 5ºC for the rest of the print. For the batch of PLA used when writing this, those temperatures are 230ºC and 225ºC. As you see, those numbers are far higher than what's normally recommended for PLA. Second: Print slow! 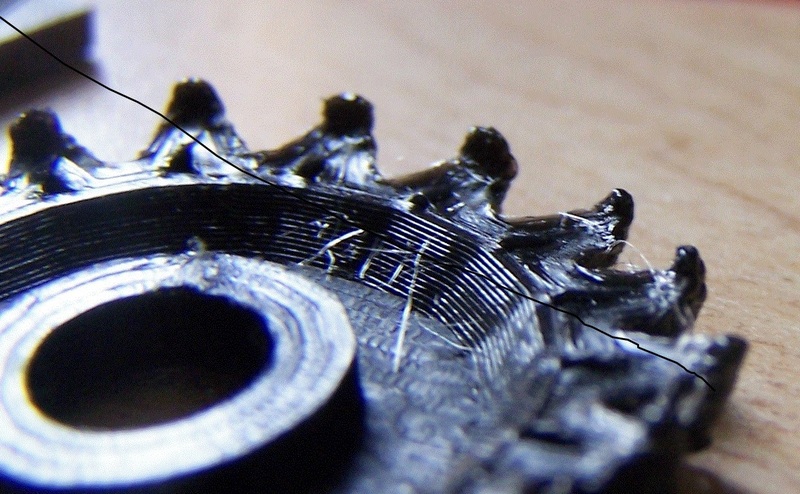 Even if the filament extrudes and flows nicely, PLA is a material with high friction. Also, using a high temperature causes some degradation, and this can cause clogging or feedback if pushing too hard. 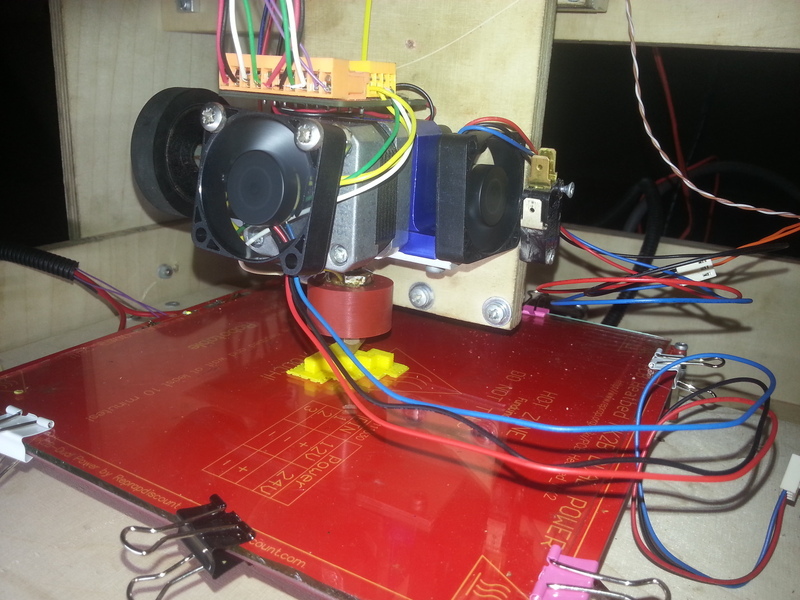 The best approach to reduce the pressure in the hotend, is simply not pushing that hard. A print speed that is OK for ABS will probably be too fast for PLA. I have not really created a structured approach for finding a working PLA print speed as of writing. Simply, I printed a 4-perimeter box (1.5mm wall in the model) of 100mm sides, 6mm high, and ran it at different speeds. I started at way-too-fast 55mm/s, and stepped back the speeds util I no longer saw any extruder rollback. This happened at ~40mm/s for me. At that point, I slowed down an additional 25% to account for pressures that could build up on complex parts of prints. This gives me an overall print speed of 30mm/sec. I let bridges and gapfill run at my "max speed". I also reduced my accelerations, and by doing that I've reduced the amount of "bump" the extruder needs to do. Note that as of writing, I haven't done much overhang or bridge printing. I know from previous experience that printing overhangs hot will lead to upward curling. I also know that I can cure some of that using cooling.